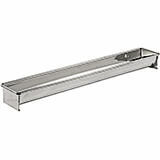 Our commercial grade baking molds made from tin-plated steel are durable and possesses excellent baking qualities. There are some items in the kitchen that are hard to clean and sanitize, but if you use them often enough, you want those items to be easy to clean. 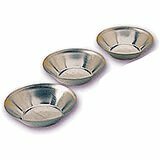 Our baking molds made of tinplate are highly durable, long lasting and easy to clean. 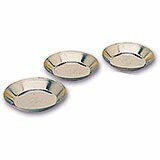 Very little care is required in using tinplate bakeware. This steel-based material is highly resistant to denting and scratching. Tinplate provides the necessary protection that helps the steel resist rusting and staining. Tin Deep Tart Mold, 4"
3.88" X 4" X 1.13"
This Paderno World Cuisine 4 inch fluted tin tart mold comes with a removable bottom for easy unmolding. The fluted sides increase the surface area, which in turn creates a strong crust capable of holding and containing the heavy ingredients of a quiche or a fruit tart. 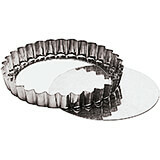 This quiche/tart mold is made of tin and has flared sides. 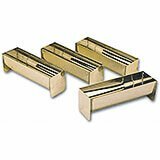 These baking molds are great to make Brioche bread or any other pastry that is formed and baked in a fluted round, flared pan. Made of tinplate. Pack of 25. Measurements: 2 3/8" Diam. x 3/4" H. Weight: 1 lb. 2 oz. 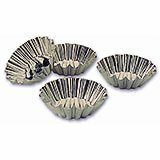 Brioche Mold - 10 Ridges.These baking molds are great to make Brioche bread or any other pastry that is formed and baked in a fluted round, flared pan. Made of tinplate. Pack of 12. Measurements: 3" Diam. x 1 1/8" H. Weight: 13 oz. 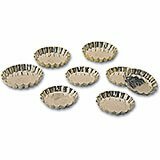 Brioche Mold - 10 Ridges.These baking molds are great to make Brioche bread or any other pastry that is formed and baked in a fluted round, flared pan. Made of tinplate. Pack of 12. Measurements: 3 1/8" Diam. x 1 1/8" H. Weight: 15 oz. Brioche Mold - 10 Ridges.These baking molds are great to make Brioche bread or any other pastry that is formed and baked in a fluted round, flared pan. Made of tinplate. Pack of 12. Measurements: 3 1/2" Diam. x 1 1/8" H. Weight: 15 oz. Brioche Mold - 10 Ridges.These baking molds are great to make Brioche bread or any other pastry that is formed and baked in a fluted round, flared pan. Made of tinplate. Pack of 12. Measurements: 4" Diam. x 1 3/8" H. Weight: 15 oz. Brioche Mold - 12 Ridges.These baking molds are great to make Brioche bread or any other pastry that is formed and baked in a fluted round, flared pan. Produces golden brioches. Made of seamless tinplate. Pack of 25. Measurements: 2 3/8" Diam. x 3/4" H. Weight: 1 lb. 1 oz. 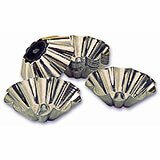 Brioche Mold - 12 Ridges.These baking molds are great to make Brioche bread or any other pastry that is formed and baked in a fluted round, flared pan. Produces golden brioches. Made of seamless tinplate. Pack of 25. Measurements: 2 3/4" Diam. x 1" H. Weight: 1 lb. 7 oz. 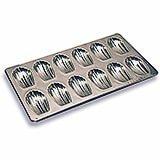 Tinplate Brioche Baking Mold, 14 Ridges, 4.75"
Brioche Mold - 14 Ridges.These baking molds are great to make Brioche bread or any other pastry that is formed and baked in a fluted round, flared pan. Made of tinplate. Priced per piece. Measurements: 4 3/4" Diam. x 1 3/4" H. Weight: 3 oz. 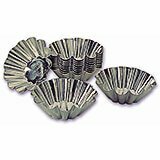 Tinplate Brioche Baking Mold, 14 Ridges, 5.5"
Brioche Mold - 14 Ridges.These baking molds are great to make Brioche bread or any other pastry that is formed and baked in a fluted round, flared pan. Made of tinplate. Priced per piece. Measurements: 5 1/2" Diam. x 2" H. Weight: 4 oz. 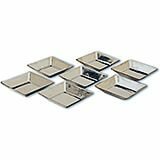 Tinplate Brioche Baking Mold, 14 Ridges, 6.33"
Brioche Mold - 14 Ridges.These baking molds are great to make Brioche bread or any other pastry that is formed and baked in a fluted round, flared pan. Made of tinplate. Priced per piece. Measurements: 6 1/3" Diam. x 2 1/2" H. Weight: 5 oz. 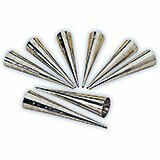 Tinplate Brioche Baking Mold, 14 Ridges, 7"
Brioche Mold - 14 Ridges.These baking molds are great to make Brioche bread or any other pastry that is formed and baked in a fluted round, flared pan. Made of tinplate. Priced per piece. Measurements: 7" Diam. x 3" H. Weight: 6 oz. 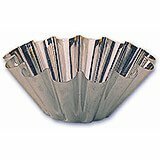 Tinplate Brioche Baking Mold, 14 Ridges, 7.87"
Brioche Mold - 14 Ridges.These baking molds are great to make Brioche bread or any other pastry that is formed and baked in a fluted round, flared pan. Made of tinplate. Priced per piece. Measurements: 7 7/8" Diam. x 3 1/4" H. Weight: 8 oz. 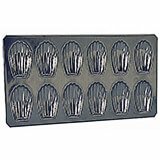 Tinplate Brioche Baking Mold, 14 Ridges, 8.62"
Brioche Mold - 14 Ridges.These baking molds are great to make Brioche bread or any other pastry that is formed and baked in a fluted round, flared pan. Made of tinplate. Priced per piece. Measurements: 8 5/8" Diam. x 3 3/8" H. Weight: 9 oz. These deep plain baking pans make great Tartlet Molds. Smooth sides. Made of tinplate. Pack of 25. Measurements: 1 3/4" Diam. x 5/8" H. Weight: 8 oz. These deep plain baking pans make great Tartlet Molds. Smooth sides. Made of tinplate. Pack of 25. Measurements: 2" Diam. x 5/8" H. Weight: 9 oz. These deep plain baking pans make great Tartlet Molds. Smooth sides. Made of tinplate. Pack of 25. Measurements: 2 1/8" Diam. x 1/2" H. Weight: 11 oz. These deep plain baking pans make great Tartlet Molds. Smooth sides. Made of tinplate. Pack of 25. Measurements: 2 3/8" Diam. x 5/8" H. Weight: 13 oz. These deep plain baking pans make great Tartlet Molds. Smooth sides. Made of tinplate. Pack of 25. Measurements: 2 1/2" Diam. x 5/8" H. Weight: 15 oz. 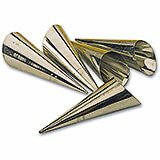 Cream Horn Molds. Made of tinplate. To shape and bake puff pastry and cream horns. Pack of 12. Measurements: 1 1/4" Diam. x 5 1/4" L. Weight: 9 oz. Cream Horn Molds. Made of tinplate. To shape and bake puff pastry and cream horns. Pack of 12. Measurements: 1 3/8" Diam. x 5 1/4" L. Weight: 10 oz. Heavy Madeleine Baking Pan. Made of tinplate. Edge rolled around a copper wire for ultimate heat distribution. Bakes 12 cookies of 2 3/4". Measurements: 14 1/8" L x 7 1/2" W. Weight:14 oz. Heavy Madeleine Baking Pan. Made of tinplate. Edge rolled around a copper wire for ultimate heat distribution. Bakes 24 cookies of 3 1/8". Measurements: 15 3/8" L x 14 1/8" W. Weight:1 lb. 15 oz. Large Horn Molds. Made of tinplate to shape puff pastry dough. Pack of 12. Measurements: 2" Diam. x 3 1/2" L. Weight: 8 oz. Stamped Madeleine Baking Pan. Made of tinplate. Count 12. Product Size 3 1/8". Measurements: 14" L x 7 3/4" W. Weight:9 oz. 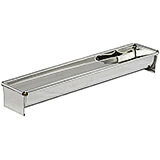 5.25" x 1.62" x 1.37"
Great to make Buche, Ham Aspic, Head Cheese or other log shape meal. Made of tinplate. Makes attractive mini vegetables in aspic or fish mousse. Pack of 2. Measurements: 5 1/4" L x 1 5/8" W x 1 3/8" H. Weight: 6 oz. Fluted Tartlet Baking Mold. Made of tinplate. This mold is ideal for individual quiches, cakes or crusts. Pack of 25. Measurements: 2 3/8" Diam. x 3/8" H. Weight: 15 oz. Fluted Tartlet Baking Mold. Made of tinplate. This mold is ideal for individual quiches, cakes or crusts. Pack of 25. Measurements: 3 1/8" Diam. x 1/2" H. Weight: 1 lb. 7 oz. Fluted Tartlet Baking Mold. Made of tinplate. This mold is ideal for individual quiches, cakes or crusts. Pack of 12. Measurements: 3 1/2" Diam. x 5/8" H. Weight: 15 oz. Fluted Tartlet Baking Mold. Made of tinplate. This mold is ideal for individual quiches, cakes or crusts. Pack of 12. Measurements: 4" Diam. x 3/4" H. Weight: 1 lb. 4 oz. Plain Tartlet pan. Made of tinplate. Pack of 25. Measurements: 1 3/4" Diam. x 3/8" H. Weight: 7 oz. Plain Tartlet pan. Made of tinplate. Pack of 25. Measurements: 2" Diam. x 3/8" H. Weight: 9 oz. Plain Tartlet pan. Made of tinplate. Pack of 25. Measurements: 2 3/4" Diam. x 3/8" H. Weight: 1 lb. 1 oz. Plain Tartlet pan. Made of tinplate. Pack of 12. Measurements: 3 1/2" Diam. x 1/2" H. Weight: 1 lb. 4 oz. Plain Tartlet pan. Made of tinplate. Pack of 12. Measurements: 4" Diam. x 5/8" H. Weight: 1 lb. 1 oz. Square Mold. Made of tinplate. Make mini-square tartlets or quiches. Pack of 25. Measurements: 2 5/8" L x 1/2" H. Weight: 1 lb. 3 oz. Tinplate Yule Log Cake Mold, 13.75" X 2.37"
13.75" x 2.37" x 1.75"
Buche / Yule Log Cake Mold. Made of tinplate, with rim. Edge rolled around a copper wire for ultimate heat distribution. Yule logs are easy to create with this mold. Measurements: 13 3/4" L x 2 3/8" W x 1 3/4" H. Weight: 11 oz. Tinplate Yule Log Cake Mold, 19.75" X 3.12"
19.75" x 3.12" x 2.12"
Buche / Yule Log Cake Mold. Made of tinplate, with rim. Edge rolled around a copper wire for ultimate heat distribution. Yule logs are easy to create with this mold. Measurements: 19 3/4" L x 3 1/8" W x 2 1/8" H. Weight: 1 lb. 2 oz.